Mayday is a workbench for visualization, analysis and storage of microarray data. It features a graphical user interface and supports the development and integration of existing and new analysis methods. 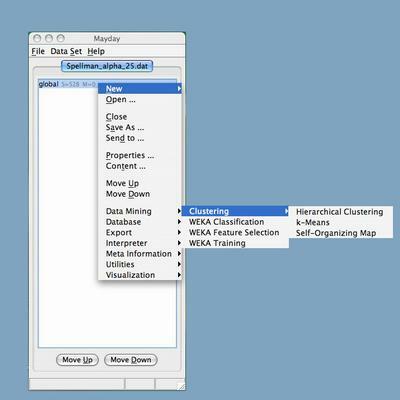 Besides the infrastructural core functionality, Mayday offers a variety of plug-ins, such as various interactive viewers, a connection to the R statistical environment, a connection to SQL-based databases, and different clustering methods, including phylogenetic methods. In addition, so-called meta information objects are provided for annotation of the microarray data allowing integration of data from different sources, which is a feature that, for instance, is employed in the enhanced heatmap visualization.